Virtual Career Fairs are becoming increasingly popular with employers and job seekers around the country. They are a convenient and innovative alternative to traditional job fairs that allow companies and talent to connect in a way never before possible. The odds of companies finding the right talent increase dramatically when obstacles like distance and schedules melt away. One major benefit of using a virtual career fair for finding job candidates is the savings to companies and recruiters. Since the career fair is virtual, rather than at a set location in the physical world, it costs less to host. You don’t have to worry about booking a large event space to hold the job fair, you won’t have to rent equipment or supplies, and your hiring managers and recruiters won’t have to leave the comfort of their offices in order to man virtual recruiting booths. These are just some of the cost-effective benefits that make virtual career fair software so attractive to companies in the current employment climate. Virtual job fairs can also speed up the recruiting process, since you can interact with candidates before you proceed with interviews, and it’s easy to escalate candidates you’re interested in. It’s also generally easier to arrange meetings with hiring managers since there’s no travel involved. While a physical job fair will only reach candidates at a specific location, a virtual career fair expands your reach to anywhere in the world. Virtual Career Fair takes the benefits of a physical career fair and removes the barriers for employers and job seekers of having to travel. This is a tremendous benefit for companies hiring regionally, nationally or globally. One global professional services firm held a two-day virtual career fair that spanned 40 countries, yielding 20,000 registrants and 10,000 attendees over the course of 48 hours. Virtual recruiting allows candidates from any time zone to engage with your organization when it’s best for them. Many of the attendees who attend virtual career fairs are hard-to-find “passive” candidates who are currently employed and appreciate the ease (no need to take time off of work) and privacy (they have concerns with being seen at a physical job fair) of attending a virtual career fair. As an employer, the virtual career fair enables you to gain access to top notch candidates and screen them efficiently. As a job seeker, you can take an hour or two out of your busy day and connect with multiple employers without leaving your desk. Also, instead of a physical job fair that lasts a specified length of time—one day, one week or one month, for example, you can present an online recruiting center that’s open on an ongoing basis, cultivating candidates 24/365. During the hiring process, information gathering is a two-way street. Not only do your company’s recruiters and hiring managers have a lot of questions, so do candidates. Virtual Recruiting centers allow candidates to view presentations, download materials, and even chat or speak with company representatives. And after the hiring, a virtual career center can also be used for virtual onboarding. You want to maximize the level of candidate engagement before people are brought in for interviews to ensure that they are perfect fits. A virtual recruiting environment allows you to get a better understanding of candidates before you engage. You can view documents they’ve provided, interact via chat and Skype, and even hold an instant meeting. Virtual career fair software can reduce costs and eliminate the need to travel, speed up hiring and improve your access to the global talent pool—so you can find people with the right skills, whenever and wherever you need them. For more information on Virtual Career Fair Software go to Virtual Career Fair Software. 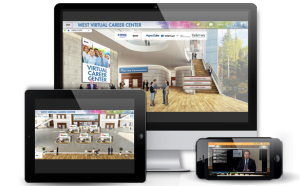 Article – What is a Virtual Career Fair?